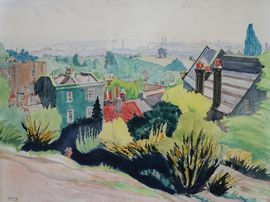 Harry Aaron Kernoff (1900-1974), an Irish painter of London/Russian extraction, is primarily remembered for his sympathetic interest in Dublin and its people. He depicted street and pub scenes, as well as Dublin landmarks with sympathy and understanding. This is particularly evident in his woodcuts. While living in his adopted Dublin Jewish community he produced picture illustrations of his local scenes for a neighbourhood writer and friend, Nick Harris for his book called "Dublin's Little Jerusalem". Harry Kernoff spent the vast majority of his life unappreciated, and made little or nothing from his paintings until a few years before his death, when he began to be appreciated by contemporary critics. Kernoff never married. Outside his home in Dublin, where he lived with 2 unmarried sisters, there was a long-standing sign in the front garden which said "... Descendants of the Abravanels..."The Abravanel (or Abrabanel) family was one of the most famous Sephardic Jewish families in history, noted for their large quotas of Rabbis, scholars, and members of a variety of scientific and artistic fields, dating from about the 13th century in Lisbon. The emergence of the famous philosopher and scholar Don Isaac Abravanel in the middle of the 16th century brought his works to greater universal recognition. 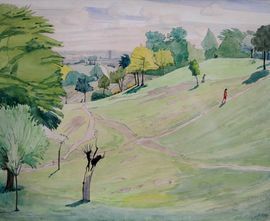 Born in London, Kernoff moved to Dublin and became a leading figure in Irish modernism. Influenced by Seán Keating, Kernoff painted the Irish landscape, genre scenes, and portraits. In 1930, Kernoff visited the Soviet Union as part of an Irish delegation from the friends of Soviet Russia led by Hanna Sheehy-Skeffington. While visiting, he was influenced by the Association of Artists of Revolutionary Russia. Kernoff is famously associated with Davy Byrne’s pub. His paintings and woodcuts of the pub are documents of his friendship with the original owner.